The Frager Factor: The Castello Brothers: "You can build out in Brooklyn or NJ, but dot com is 5th avenue and will always be the gold standard for TLD"
The Castello Brothers: "You can build out in Brooklyn or NJ, but dot com is 5th avenue and will always be the gold standard for TLD"
"You know what, we have a global market on Whisky.com. Let me shoot up a couple of pages. There's a 40 year Laphroaig." He wanted $3,200 bucks for it. I said, "Let's put it up. Let's just put a page up. Let's do something like what a normal magazine would do. Just throw up a nice picture." It just took a second to throw up. Within 24 hours, somebody from Sweden wrote saying how much to ship it, how can I get it?" Jeff: Sell ads, buy properties, negotiate, bring in partners, there's a lot of work that goes into this behind the scenes that you don't see in the building of a successful site and successful organization. Michael: Absolutely, put an hour in a day. You'll be surprised where you'll be in a year or two years. PalmSprings.com, before David got involved in '97, I basically took a half an hour to an hour a day and built that site out. Within two years, it was receiving phenomenal traffic. It was amazing the people I would run into that would say, "Oh, I've been to that site." Again, if you give the content, if you find ways of reaching out to your audience, they'll find you. If they find that content to be relevant, they'll be back. It just grows. Exponentially the Internet will always grow. If you stake your claim now, lay down your foundation now, your property actually grows exponentially with the Internet. Jeff: Interesting, interesting. Is a successful domain a matter of . . . you spoke of branding, you spoke of having the right name, you spoke the legs of the stool are tenants of the business. Isn't a matter of marketing and branding, as opposed to just developing a site that's too generic to build a brand around? David, you want to discuss that a little bit? David: A name, a name can never be too generic. The more generic it is, the harder it is to get your arms around it. That's why with Traveler, which is a huge name, we had talked to Rob. Actually, I had written to congratulate him because I think Scott Faser became their COO. I saw an article on DNJournal. I just wrote a congratulatory letter. He wrote me back and we started talking. We were just talking business which we both love to do. When I mentioned Traveler, he said, "Oh, you got travel. I've got an idea for that." That's how it started. Michael met with him in Los Angeles, then we flew up to Seattle. We started flying back and forth. He has put together a great team, great CEO, great programmer people working on it. That was, that's a huge generic name. Yeah, you have Hotel.com, you have Cars.com, these are huge names. With our city names, whether it's Nashville.com or Acapulco or PalmSprings.com, those are also generic names in their own right. They encompass one city, one area. So it was easier in certain ways for us to capture it and start to monetize it. The name, it's like we said from day one, the name matters. The name really does matter. Yes, you can have an eBay and yes, Amazon before they did what did was either one of the longest rivers in the world or 10 foot warrior women from 2,000 years ago. You can take a name and do things with it. That's also, a lot of people got in from the beginning, to get a name now. Yes, there's a Google, there's YouTube, for every one of those there's Hotels.com, Cars.com - there's all these domains. It does matter. It really goes back to simple branding. Jeff: Talk a little bit about what it takes to brand and market a name. There's people out there who might not be as savvy a marketer or a brander. Branding as a concept on the Internet, there's a lot of people who are "branding" experts who teach people how to brand themselves. Teach them how to create Brand U. What would you say are some simple and next steps, just very quickly, to branding your site? What do you do beyond putting a site out there and trying to spread the word? What have you found to be the most successful things that people can possibly translate to find success in their own right as far as marketing and branding a site that they have? David: I believe that any site that you put whether it's even a PalmSprings.com or RawChocolate.com, the point of it is there's a lot of people out there, across the United States and across the globe. Even if there's one in each state or one in each country, the fact of it is that people are looking for something specific. If you carve out your niche, I tell people all the time. Look, we have competitors in PalmSprings and Daycare and Acapulco. Why are there competitors? Because, obviously, there's only so much we can do in so much time. Our competition's going to say, you know what, they're not doing this. Let's do that. 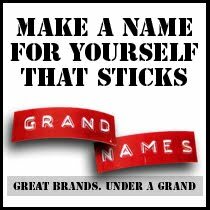 If you get that content up there, that helps brand your name. Secondly, we also use one program which is Submission Wizard. I've been using for quite a while. It will actually submit a site to, I believe, 1,000 search engines. I didn't know there were that many out there but there obviously are. You take it and you take a page and you put it through that program. It basically shoots it out to everybody within that day. If anything, it just tends to get a certain push out there. It gets a push on that link. For whatever reason, things do tend to ripple across the Internet. It's bizarre. I find the same thing with Daycare. Somebody will sign up from someplace in Minnesota. Two weeks later somebody from the same area will also sign up and pay. I'm going, "Why does that happen?" I don't know why a lot of this stuff happens. I got to tell you, it's a lot closer to the surface than you think. What you do does make a difference. You just have to promote it correctly. The more you promote it, the more you're distinctive about what you're promoting, the more you're branding. Once somebody gets what they're looking for, they can bookmark it. That's direct marketing right to you. They're no longer going through Google. They're going through the bookmarks. That, again, helps establish you with your customer. Jeff: You're very public. You're very open. You're very outspoken. You're panelists. You're participating here. You're participating in industry events. You're award winners. Getting out there, also, I would imagine is part of the branding exercise. Where you have a face, you are involved with the people in a real sense as opposed to just being virtual and having sites. Is that an effort that you have done to help brand both your business as well as your domain? David: It's interesting. It's interesting because Michael and I were in the entertainment business. We're used to being on stage. We did a complete 180 when we started this business. We did not appear in public. Michael started buying names in '94, '95. I came into the picture in '97. We did not appear in public until October 2006. We went to the TRAFFIC in Florida which was great because that's where we met Ron Jackson. Then he said, "I want you for my December cover story." Things took off really fast after that. It's really ironic that for so long we kept ourselves submerged. We just were working. It's really something, in retrospect, I wish we had poked our heads up above a little earlier. It's been fun. It's really, if you get the recognition, it's been great, it's been fun. Yes, I want to get back to one other thing about the names. One thing that Michael and I really do is we focus on intuitive branding. What you'll notice is that every one of the names that we develop, it's pretty logical. What we do with Kennel, what we do with Whisky, what we do with Traveler, we're not taking a name and then going off and creating a different definition. All the names that we own have direct navigation. They have intuitive traffic. We like to call it the heartbeat. We feel that's really, really important because if people are going to a name a certain way, the name is pretty much telling you, "Do this with me. Develop me this way." It's kind of speaking to you. The name will speak to you if you listen to it. That's why what we do with these names; it's just a natural flow. We're going with the flow of how people are interpreting and using the name. That's why I'm saying, that's why direct navigation is so important. If you have any name, I don't care if it's just getting five visitors a day through direct navigation, it's got a heartbeat. It's got a pulse. All you have to do is go along that linear line and you'll be fine. Jeff: Interesting. You have focused both on internal development and revenue sharing partnerships that bring in outside partners. You've discussed that some already. How do you decide which path to take? Which, again you've touched on it but which is right? Which seems to work best in any given situation? Michael, what do you think about that? Michael: It's not easy. We've some of the most premium names on the Internet really sitting, a backlog more or less for a reason. As David was saying, Bullion kind of reaches out to you. At this point in time you tend to look and say, "Okay, this is a great time to Bullion out there. There's a lot of people from around the world that's interesting." From Asia we get a lot of traffic to Bullion.com. But your audience reaches out to you. When it comes to something like Traveler or Rates.com or Sample.com, these are names that are big names. They're actually bigger than for what our organization can handle privately. That's why someone like Monster Ventures, we believe was the perfect arrangement for Traveler because they have really what I think was needed and maybe what we lacked. It's timing and it's what you feel comfortable with. These things can all take their own different paths. The one thing you start finding out is that when you do things, if doors start opening you know you're going in the right direction. Jeff: A lot of I guess is watching trends also. You'd have to be a fool not to see that in the current economy and it's been historical that precious metals grow in value when an economy becomes worrisome. How much of it is trend watching? How much time do you spend watching to say, now's the time we've seen a growth in whiskey, for example, just to throw one out there. Or bullion, you've seen a growth in precious metals in the their value and in corresponding concern among consumers and investors. How much of that is trend watching? How much time do you guys spend actually reading, not just reading the newspaper, but seeing what's going on and how that can affect a specific piece of your inventory? What do you think on that, David? David: It's a creative spark. For instance, what happened with the stock market, immediately I started seeing all these things about precious metals, about gold bullion, silver bullion, platinum bullion, and it was just there. It's funny. You never know what's going to trigger. It really does have to be fun for us, because when somethings fun, you'll work on it 80 hours and not even know you worked on it 80 hours that week. Michael and I, we'll be playing poker and smoking cigars and drinking scotch whiskey and scotch whisky is spelled the way we own it, W-H-I-S-K-Y. After a while it's like, "hey, this McCallum's a great scotch." We own Whisky.com. Suddenly we're writing articles. We're starting to build it. It's really the way you have to do it. Michael: Dave, do me a favor. Pull up Whisky.com and pull up the Laphroaig page. It's just interesting for the fact, I don't know whether Whisky's going up now with our visitor base because of the economy or not. For whatever reason, people are definitely drinking more whisky. We actually have a local cigar shop here where the proprietor has some amazing bottles of whisky that are very rare and very hard to find. 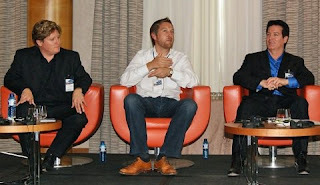 I said, "You know what, we have a global market on Whisky.com. Let me shoot up a couple of pages. There's a 40 year Laphroaig." He wanted $3,200 bucks for it. I said, "Let's put it up. Let's just put a page up. Let's do something like what a normal magazine would do. Just throw up a nice picture." It just took a second to throw up. Within 24 hours, somebody from Sweden wrote saying how much to ship it, how can I get it? That just shows you the reach that you have in something like this. It's from a local level. Our slogan with Traveler on CCIN was "local voice, global choice." This is exactly what we're doing. We're allowing those from anywhere in the world to really look into and find what they're looking for anywhere. If you provide that, that is something that I think is just phenomenal to what the Internet can offer at this time. Jeff: It's interesting because we've seen that and seen how you guys have been able to do that. David, you and I were discussing previously with the fear about the economy. You made a comment about the economy being healthy for the domain business. Why do you believe that's so? 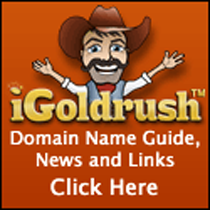 How will domains fare now and after the current economic situation maybe corrects itself? Why do you call the economy healthy for the domain business? David: Because I believe we're going, it's more than just a deep recession or pseudo-depression, whatever people want to call it. There's a power shift going on right now. This is different. Michael and I both felt this independently. Michael and I think alike on some things, on some things we think very different. We're both on the same wavelength that's where we feel like we're hitting on something. We're both speaking about it last month. There's definitely a power shift. I feel that we're seeing a lot of the death of brick and mortar. We're seeing a lot of what happened on Wall Street. It's never going to be the same again. The Internet was the 800 pound gorilla sitting there that people were kind of walking around. Yes, we had the dot-com bubble that burst. If you look at why that burst, a lot of it was because it was too much ahead of it's time. The public wasn't embracing it enough to really allow those companies to survive. Yes, you had some dopey IPOs and some dopey business plans, but if you look at a lot of those things that went down in early 2000, they could have survived now. The Internet kept growing and growing. It's taking over more advertising. We see it on our level. We're taking away advertising from a lot of traditional media. As you can see today, the Miami Herald is going on sale. The Chicago's paper in trouble. A lot of traditional brick and mortar is struggling. The Internet has continued to grow. It's become own . . . there are a lot of people that are doing it that are very independent like we are. We just went ahead and we keep doing our own thing. We're growing and there a lot of people out there doing the same thing. There's a whole shift going on right now. I feel by the end of next year when the dust settles there's going to be different types of real estate. There's going to be different types of businesses. People that own the domains, you own the addresses; you own the real estate of the new economy. As far as I'm concerned, the two best places you could be right now if you really want security are domain names and probably gold bullion are probably the two best places you could be right now. When the dust settles, it's particularly important for people to start developing their names. Build that brand. Build that address. Really what you're doing is you're magnifying what's already there. You're making it become it's own entity, which we've done with our names and we'll continue to do. That's why Michael and I feel that, when the dust settles, the people that are in this that own these names and own these addresses, it's only going to get better when ICANN releases all those TLDs. That's going to be a nightmare. The public always goes for the easiest common denominator which in this case is dot com. Those are the addresses. It all comes down to basic marketing 101. It comes down to basic branding. The people that own these domains will be the future gatekeepers. Jeff: You mentioned, again we've discussed off line a little bit about the release of these TLDs next year by ICANN and how it will affect the domain market. Michael, thoughts about how that's going to affect it beyond what David said and what do you feel how this is going to . . . what change do you envision happening? Or impact, I guess, is more the word than change. Michael: Yeah, I mean, David and I are on the business consultancy with ICANN, and we have been voicing very loudly, even though it's already passed, the fact that ICANN has an obligation to define to the public certain aspects to basically simplify. John Postal, early on, could've just went along with the IPs and said, "You know, like phone numbers, people can navigate through IPs." No, he said to himself, "We should put a name, a domain name, attach it to an IP. It makes it easier, it seems to resonate better." That was simple. People kind of understood over time that dot com meant the Internet. I see dot tv advertised, I see dot mobi advertised. I see other names out there, but again people, the majority of business owner, the majority of what you want is a larger audience. If I was thinking like a Disney, I would think what's the greatest recreation audience? For us, it's been dot com. That's what we bought into dot com. These new names I think are going to confuse. Is it to the left of the dot or to the right of the dot? How am I going to think here? I think in a lot of ways very simply, on a very gut-level. For me maybe the idea of Robert dot email dot com might make some sense, but for the most part I believe the branding and the billions that have been spent on establishing dot com, dot net, and dot orgs. For us, I believe people will still gravitate towards that. Who knows, maybe future public, maybe future generations will attach themselves. They'll be a vanity type name that will really strike a chord with a certain part of the public. No doubt about it, that is going to happen. To buy into these names for at least $180, $200 grand to buy into a name and hopefully hope that you'll get it, then having to manage that which is going to cost millions, I just don't see it. I don't know why. In the past when they vetted out a name or two every few months and there really was a lot of chaos and a lot trouble with that, why all of a sudden releasing hundreds, if not thousands, is going to somehow equate to defining how to navigate better for the public. I think it's going to be better for Google in the short-run and the long-run. In the long-run what's better for us and better for the public is if we define these names, these dot com names that people are expecting to find the content on. That's where we're headed. That's where Dave and I are headed and we're full steam ahead. David: If you want to know what's going to happen, look at what the plight, what happened with dot travel. Travel is one of the most popular genres on the Internet for monetization. So they launched dot travel with no competition. Once all these TLDs come out, there's going to be a tsunami of them. Comes out with dot travel and it didn't do very well. That's a great generic TLD. If that didn't do well when there was no competition, I mean if you're talking about having dot ebay, dot cbs, dot amazon, those are brands that people already know anyway. If those people want to do that fine. But if someone is going to take a name and then try to start from zero, good luck. It's not just that dot com became popular. Dot com is synonymous with the whole Internet revolution and that's going to last a while. I agree with Michael that way down the pike, dot this, dot that, then they start as new generations come onto the Internet. Yeah, it may be different. For a while, dot com will always be the Madison Avenue. You can still build other, you can build out in Brooklyn or New Jersey, but dot com will always be for marketing will always be the gold standard for TLDs. David and Michael Castello, COO and CEO of Castello Cities Internet Network, Inc. (CCIN). Their 1,000 name portfolio includes Rate.com, Sample.com, Driven.com, Bootleg.com, Manicure.com, and Golfclub.com among others. But they've really made their mark developing geo-domains like WestPalmBeach.com, Nashville.com, and Acapulco.com. Their debut site, PalmSprings.com, launched the geo-domain category in 1995 and today generates more than $750,000 a year in front page ad revenue alone. Recent CCIN projects include: Whisky.com, the world's largest site about scotch and bourbon whiskey; Kennel.com; Traveler.com, a joint venture with Rob Monster; and Daycare.com, with over 12,000 facility members. Just this weekend, they launched Bullion.com to great global fanfare.